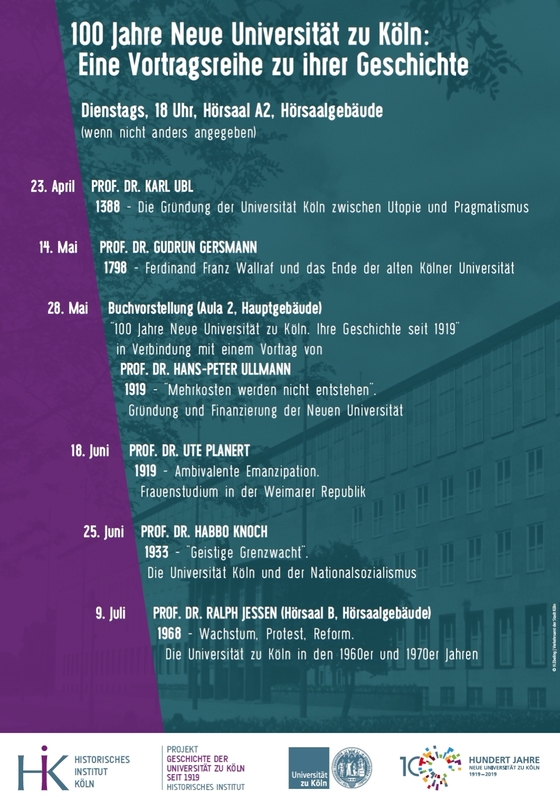 With the professorial chair in Public History the University of Cologne started a new master's degree program in history with focus on Public History. Since October 2015 the new program takes account of the media's growing interest in history and the society's increasing interest in museums, memorial sites and other spaces of historical commemoration or education. It will prepare students for a career within the field of knowledge dissemination to the general public. The new program's focus is to provide students with skills and competences which enable them to convey historical issues to the general public via different forms of media. With the master's degree program Public History it is possible to focus on every epochal and regional study of history. Different departments, together with non-university partners and networks, participate in the development of the course of study and offer a comprehensive insight into the theory and practice of Public History. The program is settled at the Department of Didactics of History and History of European Integration. Here, the joint series Geschichtsdidaktik diskursiv is edited. Diversity is encouraged at the University of Cologne. In doing so the university agitates against discrimination and for equality of opportunity. For further information see the homepage Gender Equality & Diversity.